Samsung adopted an innovative antenna system in 2006 to “enhance handset safety by radiating most of the transmitted RF energy away from the handset user” and improve RF (radio frequency) performance. Searching for a way to lower radiation exposure based on the FCC’s SAR guidelines sounds like the smart, responsible and educated thing to do—right? Think again! This post points out several shortcomings of the general acceptance of safety guidelines being thermally based and not addressing actual microwave radiation exposure at below thermal levels. It’s a good idea to research which Smartphone has the lowest SAR before buying yourself or loved-one a high-frequency microwave transmitter that is carried next to the body all day; and from an RF design perspective, Samsung stands out as the only manufacturer striving to make lower levels of radiation exposure a Smartphone design priority. But even this is misleading when it comes to SAR levels because the FCC allows manufacturers to choose SAR testing between 5mm and 15mm of separation distance, and many phones test at different distances from the simulated head and body. It is, for this reason, it makes it almost impossible to accurately compare phones from different manufacturers to each other. The Samsung Galaxy Note 9, Model SM-N960U ranks well among popular Smartphones as the lowest SAR Smartphone in 2018 with a Head SAR Level of only 0.33 W/kg (watts per kilogram averaged over one gram of tissue) at 5 MM from the head. However, there is a lot more to phone radiation safety than SAR levels alone! 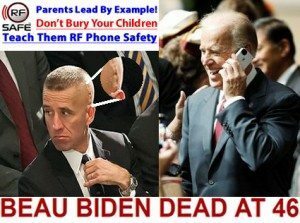 Beau Biden Brain Tumor Caused By Cell Phone Radiation? BREAKING NEWS: Canadian MP introduces Bill C-648 is to protect Canadians, by changing the way consumers think about cell phones regulated under thermal guidelines (SAR LEVELS), Wi-fi, cordless phones, baby monitors and other wireless devices, by empowering them with the information they need to understand potential serious risks to their health from long-term and continuous use of these devices, AND the greater risks to children. Cell phones sold in the USA vary in terms of their Specific Absorption Rate or SAR, the Federal government’s measure of the maximum amount of microwave radiation absorbed by the head or body. The FCC requires all cell phones sold in the USA must not exceed a maximum SAR of 1.6 watts per kilogram averaged over one gram of tissue. Official documents show the FCC is under pressure from doctors and scientists who insist current guidelines are not enough. See Reassessment of Federal Communications Commission Radio-frequency Exposure Limits and Policies” (Proceeding Number 13-84). As the FCC shuffles through 950 submissions — most calling for stronger safety regulation; Scientist and organizations have labeled SAR standards as, “not being able to protect the public“, from hazards proven at non-thermal exposure levels. As well as increased pressure for fast action regarding the FCC’s review of SAR guidelines. A cell phone’s SAR is assessed using an artificial laboratory model of a very large adult male. The lower the SAR, the less the user is exposed to thermal levels of microwave radiation. Does not consider non-thermal ROS effects linked to DNA damage. Common sense suggests less exposure to cellphone radiation is better, and the cautious thing to do is own a phone with the lowest SAR rating. Your attention should be on Samsung at this point because they make 12 of 20 lowest SAR Smartphones. This makes a very substantial difference, users of the twenty highest SAR cell phones in the USA can absorb several HUNDRED times more radiation in their heads than users of the twenty lowest SAR smartphones. For example, the Samsung Galaxy Note 9 N960U has an FCC measured SAR of only 0.33 W/kg (watts per kilogram). while an Apple iPhone XS Max exposes a user’s head to a whopping 1.0 W/kg. That’s tripple the RF radiation exposure from highest to lowest on these very popular 2018 high-end smartphone devices. Samsung was able to do this because regulatory groundwork was done by Silicon Valley start-up Vortis Technology. Under the leadership of Vortis CEO, Jim Johnson, Vortis led-the-way for changing an out-dated FCC rule on July 10, 2003, which had long forced cell phone companies to use antenna’s that transmitted 360 degrees, transmitting isotropically, known as omnidirectional in the wireless industry. After the FCC’s isotropic rule was changed so hearing aids would not be disrupted by phone radiation — Samsung went into R&D mode, leading to an innovative antenna system three years later in 2006, in their words, “enhances handset safety by radiating most of the transmitted RF energy away from the handset user” (more energy from back of phone) and improved RF (radio frequency) performance. Through most of the smartphone era, Samsung has consistently produced the lowest SAR cell phones. So, why haven’t more manufacturers adopted modern antenna technologies that both improve user safety and enhances cell phone performance? The answer is simple, no-one is forcing them to change the way their phones transmit radiation. While bigger higher-res displays and better software and hardware reap an instant return on investment– the wireless industry fears making phones safer leaves open the idea that current technology may not have been safe, to begin with, and that’s not going to fuel holiday sales. Many health researchers have questioned the utility of assessing only a cell phone’s SAR, this is all that governments currently regulate. Throughout the world, governments want the public to believe that all legally marketed cell phones are safe and that a cell phone’s SAR doesn’t matter as long as it meets their certification test. The SAR standards, however, were developed decades ago to protect users only from the acute effects of the heat generated by microwave radiation, and do not protect users from non-thermal effects of cell phone radiation which may cause harm from long-term exposure including increased brain cancer risk and sperm damage. None of the lowest SAR phones are made by the leading North American companies, Apple, Motorola, or RIM Blackberry. In contrast, thirteen of the twenty highest SAR phones are sold by U.S. companies (eight Motorola and five RIM Blackberry), and none are sold by Samsung. The Samsung Galaxy Note 2 smartphone has a maximum SAR of 0.17 W/kg (watts per kilogram). The SAR for the Apple iPhone 4S is 1.11, and for the Motorola Droid Razr Maxx, it is 1.54 W/kg. Cell phones made by American and Canadian companies have the highest SAR ratings in the world, thus subjecting users to the highest absorption rates of microwave radiation exposure. It’s time for U.S. companies to compete in terms of improving user safety. Moreover, Samsung has demonstrated that enhanced antenna technology can improve cell phone performance while it reduces microwave radiation absorption in the user’s head and body. So adoption of this technology is a “win-win” for both the industry and the consumer. But that isn’t what’s happening! 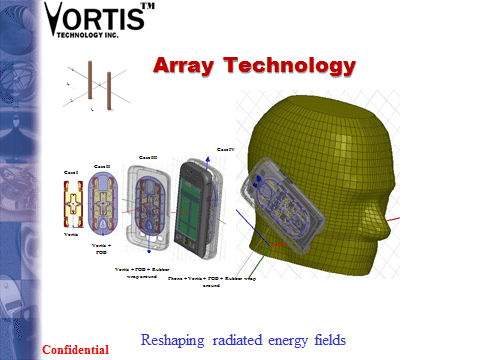 When will Vortis Technology be available inside cell phones to make cell phones safer? The cell phone industry is going the other way, they have been lobbying to weaken the U.S. standard because the ICNIRP or international standard allows up to 2.0 watts per kilogram averaged over ten grams of tissue. This may sound like a trivial difference, it is not because measuring radiation absorption over a larger volume of tissue averages out the “hot spots.” Adoption of the ICNIRP standard in the U.S. could triple the amount of cell phone radiation absorbed by Americans. Important Note: The SAR level chart below only pertains to the head SAR measurement. The partial body SAR may be less than or greater than the head SAR. For example, the Samsung Galaxy S9 has a partial body SAR of 0.96 watts per kilogram as compared to a SAR of 0.35 watts per kilogram at the head. The following charts list the top 20 highest and lowest SAR levels for cell phones sold in the United States. The list provides the maximum possible SAR level from the cell phone (many cell phones have differing SAR levels depending on where and how the cell phone is used). If your cell phone is not on either list, you can find the SAR level for your specific phone by checking the online FCC database. The same cell phone may also have a different SAR level depending on the wireless network carrier it is on. The average of 20 highest SAR phones is 1.48 watts/kilogram vs. 0.36 watts/kilogram for the 20 lowest-radiation cell phones (United States). Note: Given the popularity of the Apple iPhone, we have also provided the SAR levels for them to compare. “Protect children’s health and well-being … Current FCC standards do not account for the unique vulnerability and use patterns specific to pregnant women and children. It is essential that any new standard for cell phones or other wireless devices be based on protecting the youngest and most vulnerable populations to ensure they are safeguarded throughout their lifetimes. Reflect current use patterns. The FCC has not assessed the standard for cell phone radiation since 1996 … Many children, adolescents, and young adults, now use cell phones as their only phone line and they begin using wireless phones at much younger ages. Pregnant women may carry their phones for many hours per day in a pocket that keeps the phone close to their uterus. Children born today will experience a longer period of exposure to radio-frequency fields from cellular phone use than will adults because they start using cellular phones at earlier ages and will have longer lifetime exposures. FCC regulations should reflect how people are using their phones today. FACT: Users of the twenty highest SAR cell phones sold in the U.S. can absorb up to four times as much radiation in their heads as users of the twenty lowest SAR cell phones. These computer generated models shown below illustrate the effects of cell phone radiation. They were independently created by a Canadian university and a South African research company specializing in electromagnetic studies. http://reviews.cnet.com/2719-6602_7-291-3.html. Accessed 8/27/2012. Note that the T-Mobile Sidekick 2 is made by Samsung. (5) c|net. 20 highest-radiation cell phones (United States). http://reviews.cnet.com/2719-6602_7-291-2.html. Accessed 8/27/2012. James Lin of the University of Illinois, Chicago, who was recently appointed a member of ICNIRP, has called this proposal to increase the averaging volume from 1g to 10g ‘scientifically indefensible’ (see MWN, J/A00 and N/D00). UC Berkeley Center for Family and Community Health news releases http://pressroom.prlog.org/jmm716. Previous article Cell phone radiation and cancer: Just how much more scientific proof do you need?